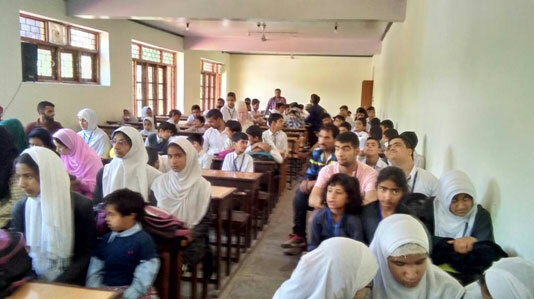 Naat competion among Able Disable students together was organised by Space communication in collaboration with Humanity welfare organization Helpline at Government Girls Higher Secondary School Bijbehara. Around 20 participants from different schools of zone Bijbehara participated in the competition. Riyaz Ahmad SDM Bijbehara was the chief guest on the occasion. Zonal Education officer Bijbehara principal model Higher secondary school for girls Bijbehara, Mohri maal tehsil Bijbehara and supervisor ICDS were guests of honour. Various lecturers teachers from government and private schools along with students with different types of disabilities were present. Twenty children recited the NAAT and Aayat Javed of Whiz kids school Batengoo won first prize. Saima Hussain a student with blindness got 2nd position while as Farhan Rahman from Crescent school Bijbehara won 3rd prize. Speaking on occasion ZEO Bijbehara said that such events give platform to students to perform in an inclusive way and create awareness about the discipline taught by Prophet Muhammad SAW. He said that education department will leave no stone unturned to empower students with disabilities. Principal higher secondary school Qaisar ul Hassan said that Prophet Muhammad SAW has taught us equality and we need to propagate the message of equality and justice. I am privileged to have two blind girls in my school and they are performing well, he added. Speaking on occasion the co organiser of the event Javed Ahmad tak said that organising the inclusive NAAT competition has one wonderful aspect that is to create single platform for all. Such events minimize the gap between able bodied and disable students. They come under one umbrella and know each other. Riyaz Ahmad SDM Bijbehara said that society comprises of various types of people but all of us have one identity that is we are HUMAN. We should behave as kind humans to save our society from inequality and social evils. All the winners will be invited to SKICC on grand finale, He added. Iftaar gift packs were distributed a.ong all participants. The programme was sponsored by J&K Bank.